Tidewater Volleyball Association is proud to release its 2019 Summer Beach Tournament Schedule. This schedule includes familiar tournaments and new tournaments to offer our area the best experience on the beach! In August 2018, the Association of Volleyball Professionals (AVP), the world’s premier beach volleyball organization, announces the expansion of new partnerships and alliances across the nation, including the acquisition of Volleyball America, the largest recreational outdoor volleyball organization in the U.S. (SEE FULL PRESS RELEASE HERE). This lead to the creation of AVP America! Through our renewed partnership with AVP America we have been given the opportunity to host not one, but two AVP events. This includes the AVPNext Gold Event on June 15th & 16th and an AVPFirst Juniors Qualifier on June 22nd & 23rd. The AVPNext Gold event comes with a $20,000 Guaranteed Purse and a wild card entry to the 2019 AVP Manhattan Beach Open. The AVPFirst winners earn a bid to the 2019 AVPFirst National Championships July 23-28 in Hermosa Beach, CA (For more information on AVPNext Gold and AVPFirst Event click here). Additionally TVA would like to announce the creation of the 2019 Juniors AAU Eastern Regional Championship. Winners of this tournament at the U14, U16 and U18 division win a bid to AAU Nationals. AAU Nationals will be held July 10th - 13th in Hermosa Beach, California at the Hermosa Beach Pier. 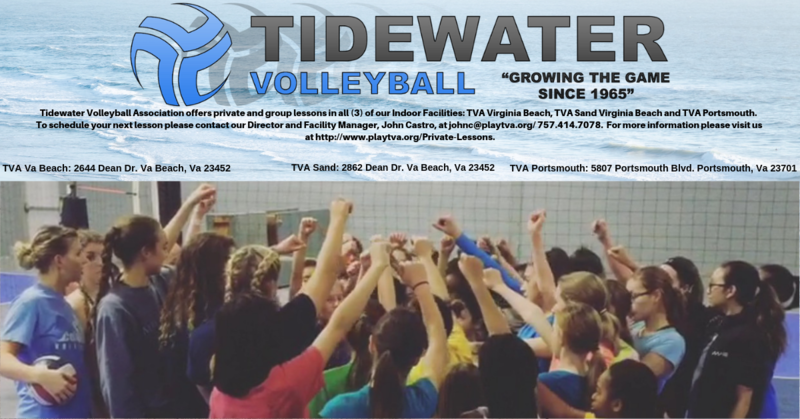 Thank you all for your support of Tidewater Volleyball Association. We hope to see you out on the beach this summer!